Mac just released their new lipstick this spring. While most brands have issued out sheer juicy formula's, Mac went for dense satin finish. They used new packaging. Still black, but with strange shaped lid in a matte finish. I do prefer their usual packaging, as this is not sleek, but just kinda weird. Form follows function- not here! Packaging aside, this is a wonderful lipstick. This is their best most luxurious formula to date. It has 77-Mineral Moist Complex for moisture with impact. Non-drying and my lips actually feel hydrated. It comes in 12 shades and I tried to purchase a watermelon shade - Lady at Play. Not to sure it was what I was looking for. Leaning a bit to orange for my complexion, but I cannot fault the formula. Style Surge was a softer version of Lady at play and maybe more my style. However, if I can use this more as a stain I think it could work quite well. Keep your makeup simple with a simple sheer was with Burberry Gold Pearl (reviewed here). Line the eye with a black gel liner and flick up slightly at the corners. A soft neutral cheek is best (maybe RMK creamy sheer powder cheek reviewed here) would be perfect to balance this bold lip. 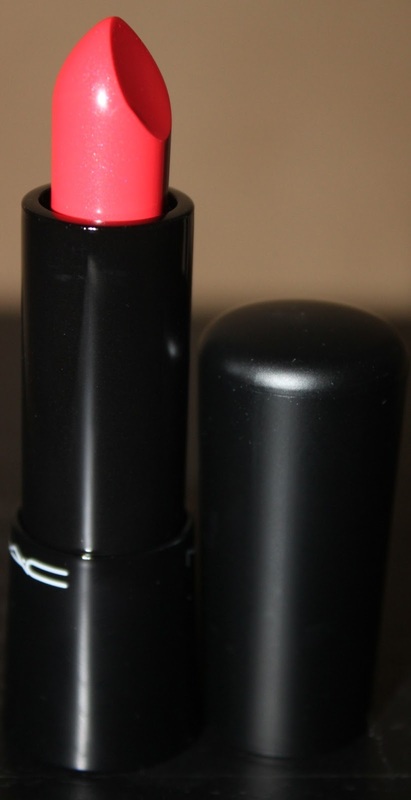 Do you love the new sheer trend in lipstick or this new Satin Mineralize Rich lipstick by Mac? Nars has is just set to launch their new Satin Lip Pencils that look similar texture to these Mac one's. I cannot wait to try them out!